Newt Gingrich: The Solution to Obamacare is more technology. Newt Gingrich to the Rescue! 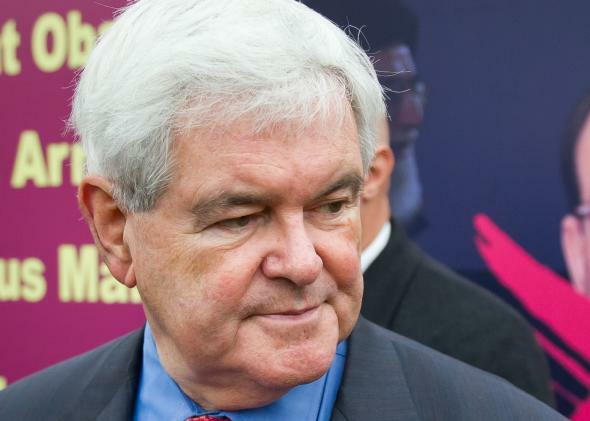 Newt Gingrich has the answer to Obamacare’s woes. The breakthroughs that are on the verge of reality are almost unbelievable. Small wireless sensors in the bloodstream, for instance, could soon catch an impending heart attack days before it happens, allowing genuinely at-risk patients to seek preventative treatment and most others to forgo expensive drugs that may not actually help them. In other labs across the country, scientists are growing all kinds of regenerated organs from patients’ own cells. Already there are people who have been walking around for more than a decade with bladders grown in a lab. Soon it will be possible to regenerate kidneys, enabling patients who today need expensive dialysis to reclaim their lives – and ending the shortages that cause thousands of Americans to die each year waiting for a transplant. Before long, regenerated pancreases, lungs and other organs could cure diabetes, cancer and many of the most lethal and costly diseases that plague us today. While it’s encouraging to see a Republican openly support stem cell therapy, the problem with the American health care system isn’t technology (not medical technology, at least). The U.S. already has the most advanced medical technology in the world, and we spend more on health care per capita than any other country. So why does the World Health Organization rank the U.S. 37th in the world in overall health system performance? Because, in terms of access and equity, our health care system is terrible.